Spotted on Shelves… Clean & Hungry Edition! These steam-in-the-pouch eats are definitely some of the best frozen meals we've ever had! They're made with simple ingredients like veggies, whole grains, and antibiotic-free meat. And every option has less than 400 calories and under 500mg sodium. Score! 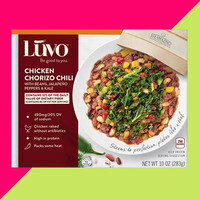 Check out the new varieties, like Chicken Chorizo Chili and Roasted Vegetable Lasagna. Then track some down STAT. Up your coconut-water game... with bubbles! This product is a refreshing new twist on something we already love. Try all four varieties: Original, Grapefruit, Cucumber + Lemongrass, and Lemon + Ginger. 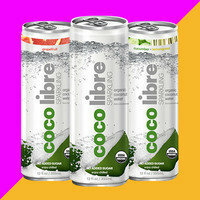 It's totally natural -- just coconut water, carbonated water, juice, and natural/organic flavors. Find it nationwide at Whole Foods; coming soon to more stores. 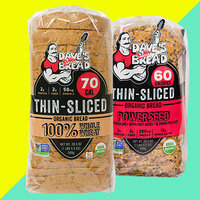 Looking for an all-natural bread option that's made with wholesome ingredients but isn't loaded with calories? Dave's slim slices totally fit the bill! In 100% Whole Wheat, 21 Whole Grains and Seeds, Powerseed, and Good Seed, this stuff is packed with protein, fiber, and hearty texture. LOVE it. Click to locate in supermarkets and natural food stores across the US. Hungry Girl Clean & Hungry hits shelves tomorrow… and the book tour kicks off on the East Coast! Starting today, ready-made cauliflower crusts and sandwich thins will be available in more stores than ever before! We love Outer Aisle Gourmet's cauliflower-based swaps -- they just might be the finds of the century! And now you can find them at every Whole Foods in southern California, Hawaii, southern Nevada, and Arizona. (And for the rest of the states, you can still order online.) Keep on expanding that distribution, OAG! New reason to eat clean: Research shows that a poor diet is related to faster aging. Treat your body right, or pay the price: Mayo Clinic researchers have found that a poor diet and lack of exercise are linked to early onset of age-related conditions. According to the study, a diet high in saturated fat, cholesterol, and sugar could trigger diseases like diabetes, heart disease, and even Alzheimer's. Boo for that, but hooray for clean eating! Speaking of which, it's now even easier to eat clean on a budget: More organic products and fresh produce are coming to Target stores. Yes! Today, April 4th, is International Carrot Day. We've got two celebratory options for you: Grin 'n Carrot Fries and Carrot Cake Overnight Oats! Make sure all your pals know about today's Clean & Hungry finds -- click "Send to a Friend" now!